They love books in Le Sueur! 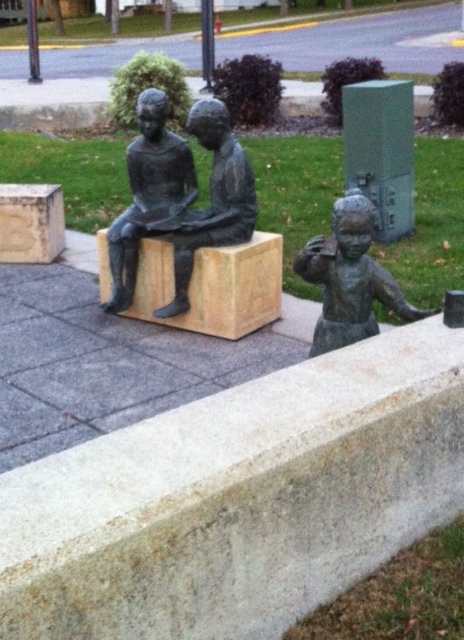 Outside of the Le Sueur Public Library. Seriously, all I really need when asked to attend an event is coffee and a lot of homemade baked goods! 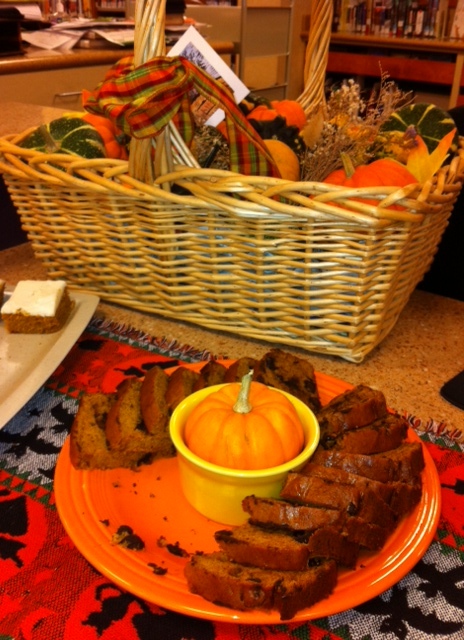 The bread, carrot cake bars, and cinnamon thing-ies were delicious! I had the privilege of being the guest speaker at the Friends of the Le Sueur Library annual meeting on Friday evening. And I stumbled upon one of the best organized groups of people committed to providing the best library services for their community. Library budgets are tight these days, but the Friends group makes it a mission to fill in the financial gaps so the public doesn’t see any decrease in service or programs. All libraries should be so lucky, right? More than 500 kids were in the summer reading program, and two free books were given to 430 individual kids as part of a giveaway funded by the Friends. A donation also helped the library purchase a color copier/scanner–the first color copier in the city of Le Sueur, available to the public. 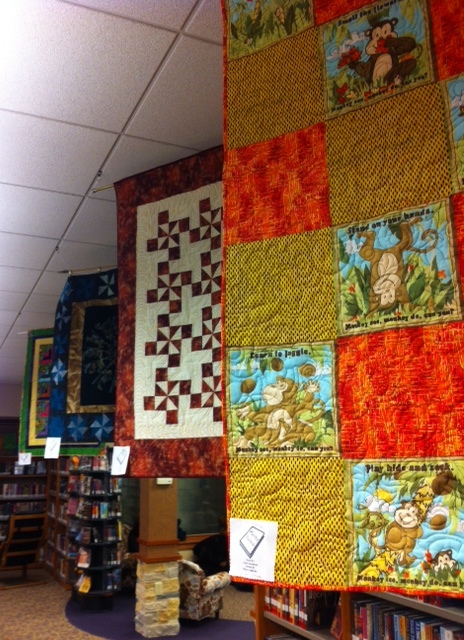 Quilts of all sizes abounded in the library. Each quilt related to a book. The variety of quilts and skill of the quilters amazed me. 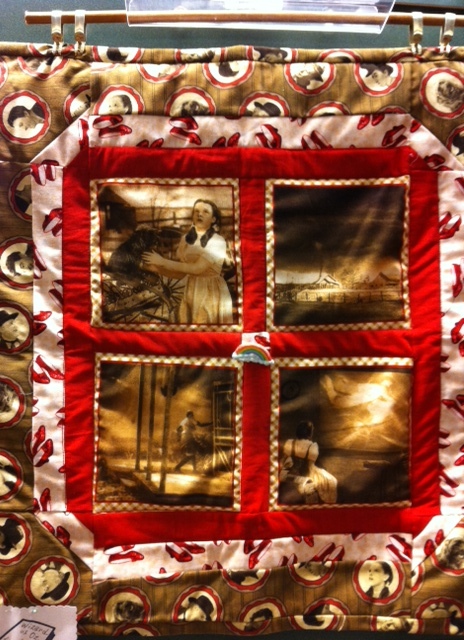 This quilt depicts the Wizard of Oz. More than 35 people attended the meeting and my reading/discussion that followed, which is a great showing for a Friday night in a small town. The library has a Facebook page. I’m sure they’d love it if you liked it! 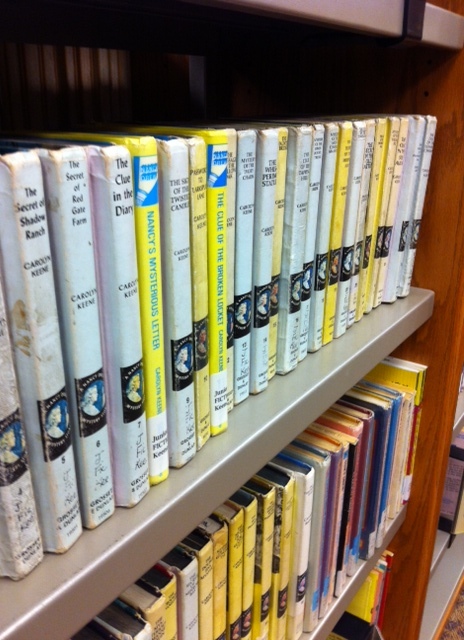 A couple of shelves of old Nancy Drew books! I camped out in front of a similar shelf at the Waseca library oh-so-many years ago. I talked to a retired doctor from Le Sueur (he said he read my book in one sitting!). Dr. Joe asked me if I knew Dr. Hergott, a Waseca physician for many years. “He delivered me!” I said. Dr. Hergott and his wife, Carol, are from Le Sueur, and I met one of the Hergotts’ nieces at the library. I also think of my fourth-grade teacher, Mr. Hayford, whenever I’m in Le Sueur because that’s his hometown. I remember we had a silly quiz one day in class and that’s where I learned to spell Le Sueur! 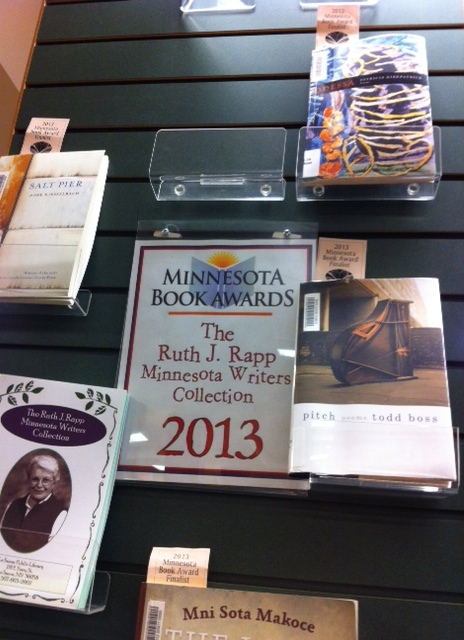 How wonderful to see a donation that is used to buy books of Minnesota Book Award winners and finalists! I also discovered I am not the only one who grew up with a poem taped on the wall across from the toilet! Thanks for making me not feel so alone, Diane! But this suggests to me that there are a whole host of people out there who also grew up with “toilet poems.” I think an anthology is in order! 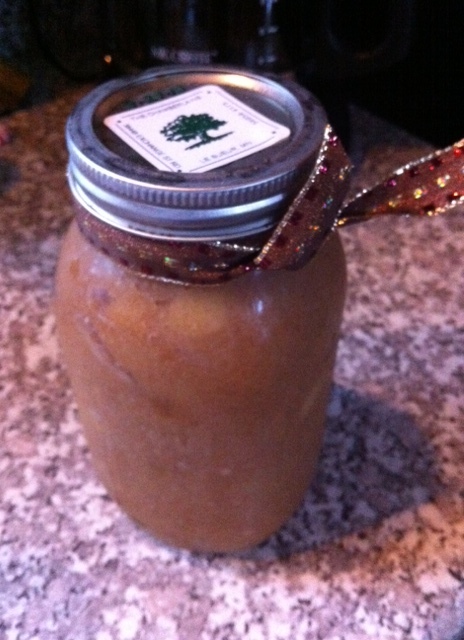 I left with a gift of homemade applesauce! Tell me where, if you gave a reading in New York or L.A. or Chicago, you would get a gift like this! 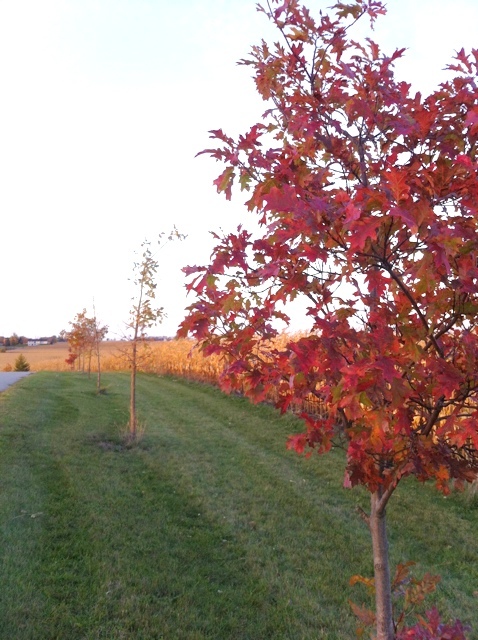 Can I say how much I like driving at sunset on an October evening in Minnesota? 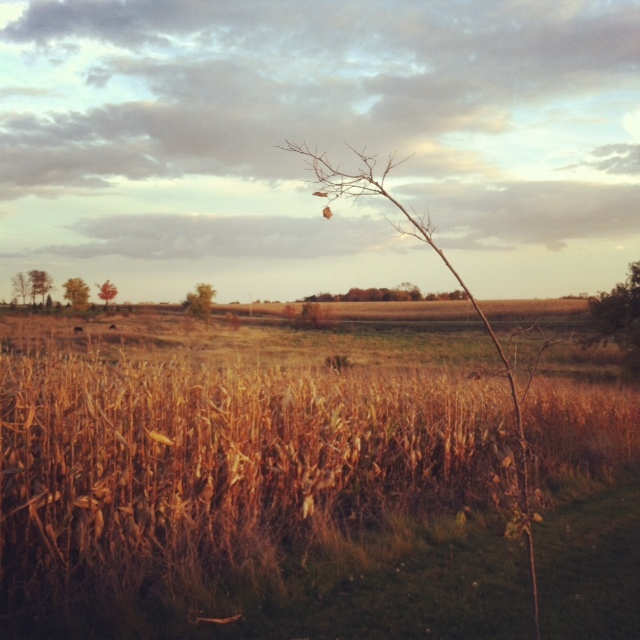 The light was absolutely fabulous on the golden corn that remains. 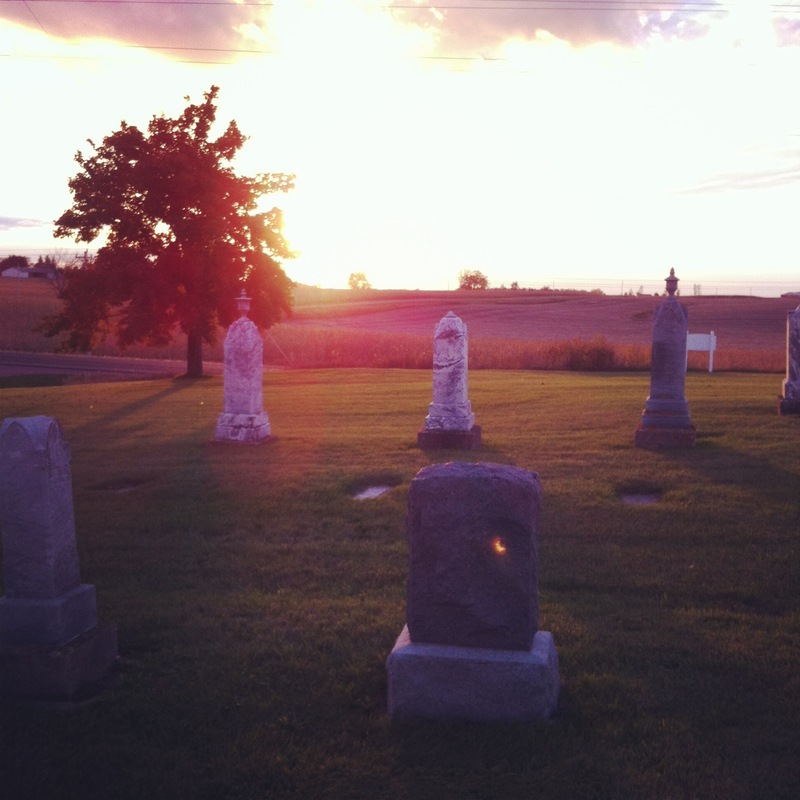 I’ve driven by this cemetery dozens of times. It’s near Cleveland on County Road 15. This is the first time I’ve stopped. I just had to take advantage of the light. A tornado plowed through this area several years ago and took out all the huge trees at this cemetery. Every time I drive by, I’m a little sad because it looks so barren and desolate. These new trees are sure to grow, though. What a beautiful evening. I’ve known a number of libraries deserving of so much praise. You did a great job of bestowing accolades. How FUN, Rachael! That’s the town where my twins first called home! I remember the library there being a great place to stroll my kids. And the applesauce–THAT is what small town readings are all about! BRAVO to Le Sueur!